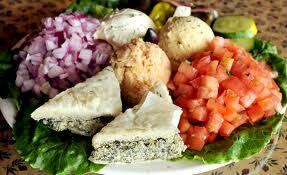 Mediterranean diet have health benefits over other diets. malignant melanoma, the most dangerous form of skin cancer. Because the fresh produce eaten by southern Europeans includes carrots, tomatoes, watermelon, olive oil and fish, it has been found to protect our skin from damaging UV rays. It is thought that consuming foods rich in antioxidants allows the body to build up a resistance to the sun's damaging rays. One reason the skin was able to defend itself was because of carotenoids, the color pigment in fruit and vegetables such as tomatoes, watermelons, carrots and pumpkins. The best way to prevent sunburn and protect against the sun's UVB and UVA rays is to use sunscreen with a high protection factor but "going Greek" could also help, because the Grecian diet consists of foods that fight the sun's oxidizing effect. A high amount of virgin olive oil, vegetables, fruits, fish, eggs, milk, fresh goats' cheese and nuts is beneficial. Olive Oil: It's the only vegetable oil that can be consumed as it is. It contains monounsaturated fatty acids and is high in antioxidatives. Studies have shown olive oil protects against heart disease by controlling LDL ("bad") cholesterol levels while raising HDL ("good" cholesterol). Cheese is often a danger food, as it is high in fat and calories. But feta has a third fewer calories than cheddar. A study showed that eating dairy products (such as feta) lowers the risk of developing metabolic syndrome by 15 percent. The syndrome is a condition that increases the risk of premature heart disease and diabetes. Tomatoes/Tomato Paste: Greeks eat tomato-rich diets, boosting the skins procollagen. A study found volunteers who ate tomato paste over a 12-week period before being exposed to UV light were 33 percent more protected against sunlight than those who didn't. It's claimed eating tomatoes can be equivalent to applying SPF 1.3 sunscreen. Olives: Olives contain compounds, including polyphenols and flavonoids, which have anti-inflammatory properties. Containing vitamin E, olives have been known to offer cellular protection against free radicals in the body. They also help to neutralizie free radicals, leading to the prevention of colon cancer. Those who consume olives are also reduce risks of diabetes later in life. Aubergines: A good source of fiber, aubergines also contain several nutrients and are low in calories. They are effective against the formation of free radicals and can also help maintain cholesterol levels in the body.